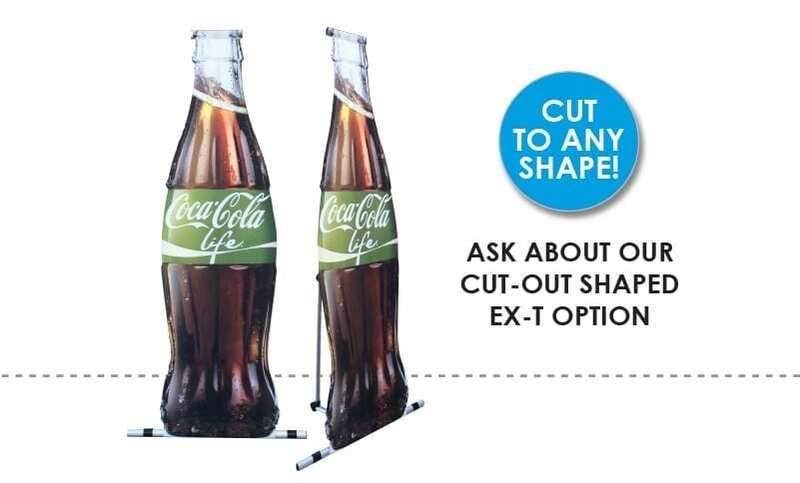 This innovative product combines creative flare of a cardboard cut out with the durability and simplicity of a pull up banner stand!�With no loose parts, this distinctive product offers a fold away branding tool that is the perfect lightweight option for your next event. And � it will get people talking! 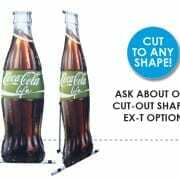 Our full digital printing means you can have any design you like, whether it be a drink bottle, glass, person, cartoon character, phone, golf bag or a drink can. You name it, we will print, cut and mount to your chosen size base. First we begin with your image. It needs to be high resolution, because at most, it will be blown up to 2m in height. The artwork department map out the best cut line suitable for your image. When marking this out they must make sure the final cut out image is centred on the banner stand and that the shape will be stable enough once erected. Once you have approved the design, we proceed to the printing phase! (this is the exciting bit) With our advanced digital printing we print your image onto our lightweight non curl banner stand fabric. After this, with a precision lazer cutter, we follow the cut line to ensure your shape is smooth and free from white edges.